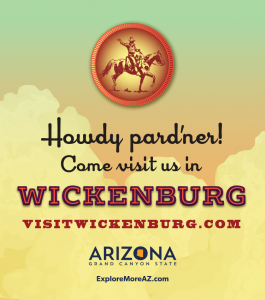 The Wickenburg Chamber of Commerce invites you to visit our western town. Founded in 1863 the miners, ranchers and farmers built homes along the fertile flood plain of the Hassayampa River. Many of these resourceful and committed settlers came from Sonora, Mexico, giving this area the distinction of being the northern edge of the Hispanic ranching frontier. The western ambiance, however still thrives. The town has cherished the best traditions of its colorful early days, through annual events such as Gold Rush Days, Fiesta de Septiembre, Bluegrass Festival and Cowboy Christmas Poets Gathering. Horses and mules can still be seen with riders each day, in the beautiful foothills surrounding the community. The variety of events each year brings local riders and visitor riders to participate in many equestrian activities. You’ll find cowboys on mules participating in the Desert Caballeros Ride, Boyd Ranch Ride, Las Damas Women’s Ride, and in the annual February Gold Rush Days Rodeo & parade, where a combination of entries makes this one of Arizona’s biggest senior pro rodeos and the 4th largest parade. October through April you’ll find Wickenburg is the team roping Capital of Arizona. Thousands of contestants of all ages compete for thousands of dollars at various arenas in the area. In March the National Team Roping Finals is held at Rancho Rio Equestrian Center. Wickenburg boasts of many equestrian riding groups for adults and children. The year round activities bring the outdoors of this beautiful high desert community to young and old from the saddle. Wickenburg of today is a modern town with over 600 businesses providing a full range of services, shopping conveniences and specialty shops and galleries for gifts of western distinction. The western ambiance still thrives. A smiling welcome is in every greeting. Friendliness and the warm spirit of good neighborliness are as evident in Wickenburg as is the inexhaustible supply of sunshine. A visitor meets it at every turn, whether his mission leads him to business contacts with townspeople or to the ranches where the most hospitable hosts in the world bid welcome. Guest ranches offer a unique western experience to tourists who fell in love with the West. The Bar FX Ranch became the first true guest ranch in 1923, followed by the Remuda, Kay El Bar, Rancho de los Caballeros, and Flying E ranches, just to mention a few. The title of Dude Ranch Capital of the World and Arizona stayed with the Town of Wickenburg for over 50 years. Today, two true American plan guest ranches remain – Rancho de los Caballeros, and Flying E Ranch. The European plan ranch is Rancho Casitas, all lend guests a unique hand on experience. Western hospitality is no catchpenny phrase here. As befits this truly western town, hospitality and friendliness are a charming part of the town’s personality, as genuine and as real as the surrounding hills. 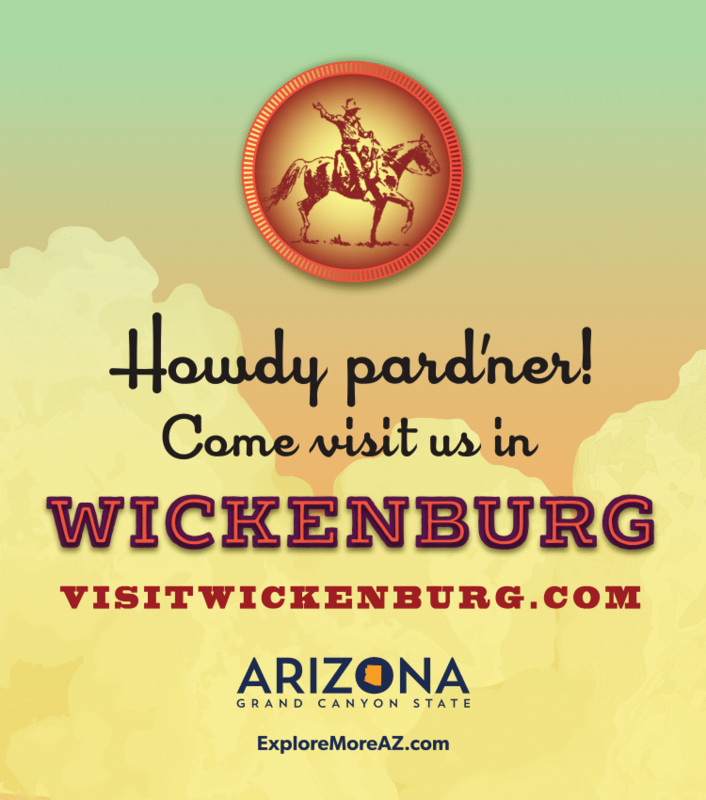 Experience Wickenburg – a town where visitors are warmly welcomed whether the stay is an hour, month, or season. It isn’t important where you’re from or who you are – the important thing is that you are here. HOWDY ! BIENVENIDOS ! WILLKOMMEN ! Our old west ambiance will bring you through the passage of time. You’ll enjoy strolling around the pedestrian friendly district where life-size bronze statues, six with narration tell the history of our community. Three beautiful murals, and other distinctive sculptures are featured around the downtown area. Frontier Street looks as much as it did at the beginning of the century, with the 1895 year old Santa Fe Depot anchoring the street as the offices for the Wickenburg Chamber of Commerce and designated Arizona Visitor’s Center. The Drover Caboose and A.T.S.F. Locomotive are open to the public Mid-October – Mid-May on Friday & Saturday from 10 :00 a.m. – 2 p.m. except on major holidays. The Desert Caballeros Western Museum on the south end of the street features a variety of noted cowboy art along with permanent art displays and special exhibitions. WICKENBURG has a variety of unique businesses who offer a diversity of jewelry, arts and crafts, gifts of western distinction, and custom designed. Many of the local businesses have specialty gifts, western wear apparel and tack, galleries, antique stores, western collectibles, furniture & gifts, Southwestern items, Native American handicrafts & jewelry, specialty foods, clothing, handcrafted leather goods, Pottery, custom cowboy hats, and much more to help create your own sense of style. Feel the experience of true western hospitality as you stop for refreshments or a bit to eat at one of our local eating establishments. You’ll find treats such as Homemade Ice Cream, sweet fruit smoothies, Cafe Mocha & Espresso, delicious pastries & desserts, or a variety of Mexican food, Steaks, Chops, Hamburgers, Pizza & Pasta, Chicken Fried Steak, as well as brand name fast food restaurants. Take an adventure back in time, while exploring the area’s attractions. Treasuring the past from which we come, in our homes today, gives enduring honor to our heritage… and a unique way to remember your visit to Wickenburg.